This deliciously adorable little pumpkin will be perfect on any Thanksgiving table! You can spice up this recipe with sausage or bacon, just make sure the meat is fully cooked. Preheat oven to 350°. Toss the bread, cheese, garlic, herbs and nuts together in a bowl. Season with pepper and stir in 1/3 cup of cream. Set aside to rest while preparing the pumpkin. Use a very sturdy knife to cut a cap on the top of the pumpkin. Cut the cap like a Jack-o-Lantern and cut a big enough cap to make it easy to work inside the pumpkin. Scrape out the seeds and strings from the cap and from inside the pumpkin. Season the inside of the pumpkin generously with salt and pepper, and put the pumpkin on a baking sheet or shallow pan. Set the cap aside. 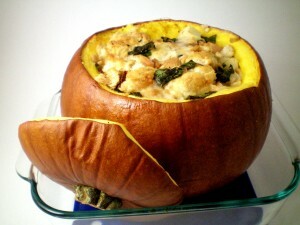 If the stuffing is dry, moisten with 2 the remaining tablespoons of cream and stuff inside the pumpkin until full. Place the cap on top of the pumpkin and bake the pumpkin for 90 minutes. Remove the cap and bake 20-30 minutes longer or until everything inside the pumpkin is bubbling and the flesh of the pumpkin is tender enough to be pierced easily with the tip of a knife. The stuffing should register 165 degrees on a food thermometer. Remove from the oven, replace the cap, rest for 20 minutes and cut into wedges to serve.